Access Israel in international partnerships to promote accessibility and raise awareness to the proper inclusion of all elderly and persons with disabilities in society, and also to facilitate opportunities for transformation of information and mutual learning. Access Israel is happy to share its knowledge and experience in order to advance global accessibility and create an international and uniform language that endorses accessibility and quality of life for people with disability making sure no one is left behind. Representatives of the organization frequently meet with policy makers and key influencers from abroad who wish to learn how Access Israel is revolutionizing accessibility in Israel and abroad. 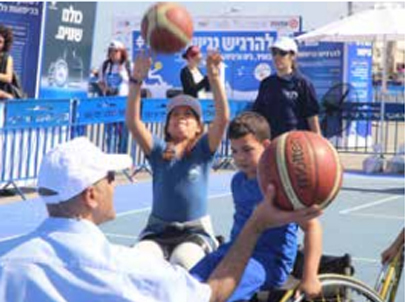 In recent years, Access Israel frequently participates in international conferences dedicated to accessibility, including the renowned Zero Project Conference, an initiative of the Essl Foundation, which serves as an international platform for highlighting innovative policies and practices that assist in creating a world without barriers for persons with disabilities. 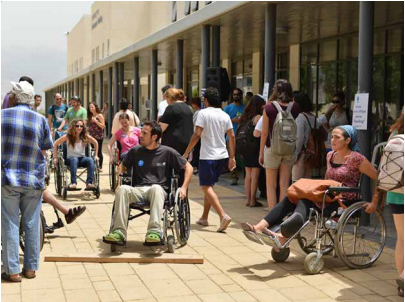 As of 2016, representatives of Access Israel took an active role in this venue, as speakers and coordinators of experiential activities that simulate disability and accessibility. 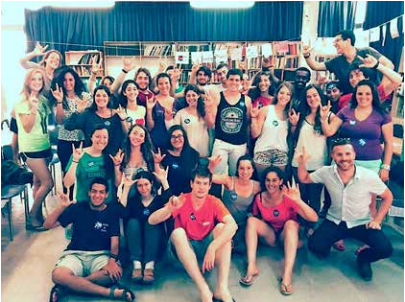 In 2016 one of Access Israel's projects "Pay it Forward in Sign Language" was awarded as one of the best innovations of 2016 as part of the Zero Project Conference. In addition two of the leading projects of the organization- "Help me Help you"- accessible training for service providers in municipalities and the Accessibility implementation model in large organizations, were preselected by UN-DESA as "best practices 2016" for the Habitat 3 conference in Quito Ecuador in October 2016. 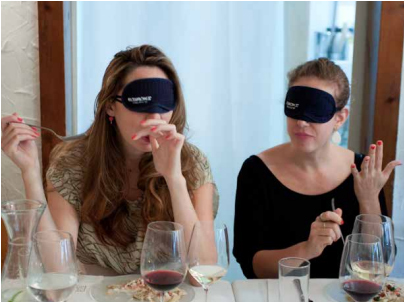 Access Israel brings its flagship awareness raising project - Feast of the Senses - to international audiences to promote worldwide accessibility. 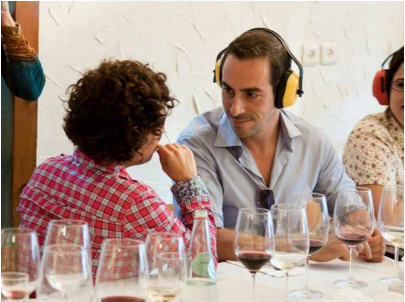 In 2015, 35 diplomats took part in the Feast of the Senses in the United Nation's ENABLE Convention on the Rights of Persons with Disabilities, under the auspices of the Israeli delegation to the UN. In 2016, a similar event was held in Vienna for foreign ambassadors and key representatives from the UN offices in the city. 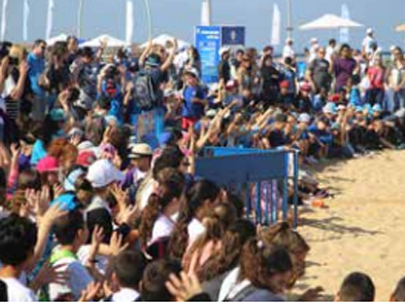 This event not only promotes public awareness to accessibility but presents Israel in a favorable light. Participants responded with enthusiasm and stated that they had never before taken part in such an enlightening and rewarding experience. Our web portal is the most popular website among people with disabilities and their families, in addition to it being an important source of information among proffesionals and service providers. 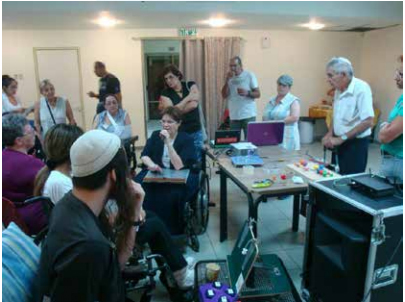 The Center offers information to the elderly and to individuals with disability through our website (ww.aisrael.org). This project is one of a kind. 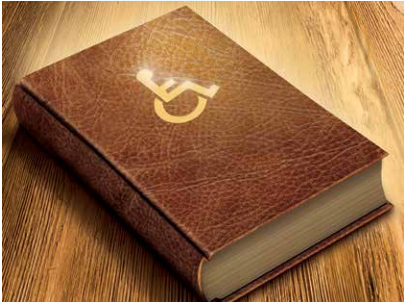 It provides essential information regarding accessible services throughout Israel free of charge in Hebrew, English and Arabic, such as accessible entertainment and cultural events and centers or any information that may help improve the life the disabled population. The website also offers updated and relevant information on current events and facilities. This service is offered at a national level–used by people from all over Israel and abroad and includes information from site all over the country. The educational program is offered to various ages of children to increase awareness to accessibility. We provide various activities tailored to different target populations. It includes informational and experiential activities. The informational lessons introduce the children to physical and personal differences and similarities between them and people with various disabilities, basic terminology and concepts relating to the disabled population and accessibility, and tips on how to help fellow individuals. The experiential activities allow the participants to get to know the person behind the disability while experiencing the various disabilities and the importance of accessibility, involving and challenging various senses to further increase awareness to the needs of disabled individuals and accessibility. Following these activities, the children take further in-the-field action promoting awareness to accessibility as ambassadors in their community, such as signing the parents and neighbors on a petition to practice tolerance and accept the other - the elderly individuals with disabilities, keep disabled parking spaces free for the disabled, and more. This service is offered at a national level and includes close cooperation with the Ministry of Education in promoting accessibility and inclusion in Israel's educational system. Tikun Olam project is a joint venture of Access Israel, Aleh Negev and the Ministry of Education, supported by JNF and other donors. The project is an educational program for 9th graders from 60 different schools, every year, throughout Israel and additional participants from abroad visiting as part of a group in Israel and looking for a meaningful program. The program provides schools with the knowledge and tools on how to better integrate people with disabilities (teachers, students, parents or visitors) into the educational system. 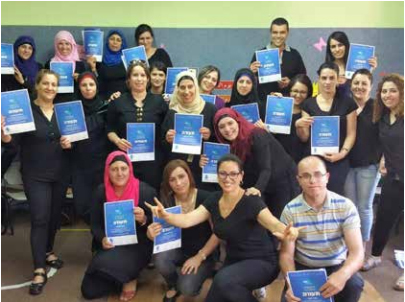 The students that will participate in the program will experience a comprehensive educational process which will provide them and their educational staff with necessary tools and skills to increase awareness, encourage volunteering in institutions such as Aleh Negev or in any other way that can help advance the program's goals, bridge over stigmas and gaps and contribute to true integration of people with all types of disabilities into society in Israel. The program offers accessibility workshops to employees of academic institutions to train them to provide accessible services to people with disabilities. The participants also take part in experiential activities to experience disability, involving various senses to further increase awareness to the importance of accessibility and the needs of the elderly and individuals with disabilities. Furthermore, we also conduct an experiential outdoor event for the students to experience the everyday challenges confronting the elderly and the people with disabilities by using simulations, and meeting face to face with people with disabilities. This service is offered at a national level in universities and academic institutional. Providing workshops that introduce participants to people who are deaf and hearing impaired and teach basic sign language. The project aims to increase awareness of the hearing community to the culture of people who are deaf and hearing impaired people and to basic sign language. 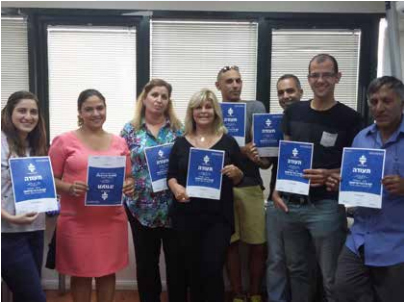 Thanks to this program thousands people of all around Israel can now communicate in basic sign language. At the 2016 Zero Project Conference in Vienna the “Pay it Forward in Sign-Language” Project was awarded as one of the Best Innovative Practices of 2016 and already created interest to be duplicated in several countries around world. The Accessibility Training Center trains employees of local municipalities and businesses to provide accessible services, e.g: making service provided to accessible such as face-to-face services, phone and internet services, public events etc. more accessible for people who are elderly and/ or with disability turning services to accessible service for all. 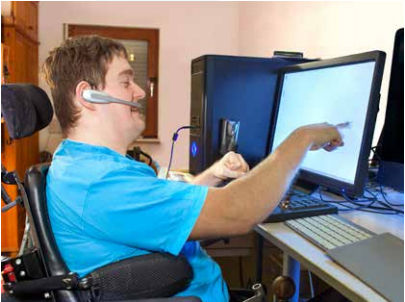 To create an accessible environment, Access Israel has developed a program to assist service providers in businesses and regional councils and municipalities to transform services and make them accessible for people with all types of disabilities (physical and sensory). As part of the program, service providers receive a series of seminars, experiential workshops, lectures and ongoing guidance and consultation on disability and accessible services. This service is offered at a national level and also with emphasis on the regional level offering customization of the training according to the unique characteristic of each region. and each specific service provided. 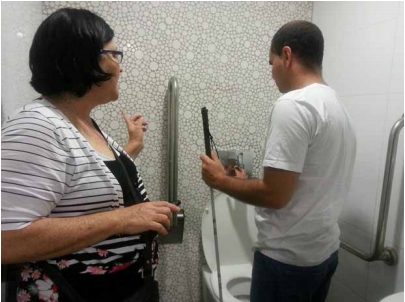 The “Help Me Help You” project training for accessible service in municipalities was preselected in 2016 by UN DESA (United Nations Department of Economic and Social Affairs, New York) as one of the best practices of 2016 to appear in a report on urban development to be published on the occasion of the UN Habitat III Conference in Quito Ecuador. Access Israel is involved in the drafting of the Equal Rights to eople with Disabilities Act and assists with the promotion and publication of accessibility regulations and standards, The Organization also follows up on necessary changes regarding accessibility in the Standards Institute of Israel. 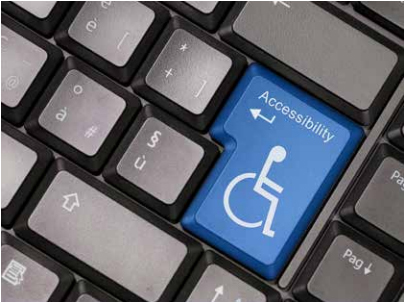 In addition, Access Israel also initiates accessibility legislation in various areas to provide an appropriate, immediate and comprehensive response to the elderly and to people with disabilities and consolidate accessibility regulations in various domains. Furthermore, Access Israel also works with governmental authorities to bring about accessible services in all spheres of life. Our involvement effects at a national level. Access Israel has launched a first of its kind legal website which has mapped and summarized all relevant legislation and legal interpretation of accessibility and inclusion related laws, regulations and court rulings. Access Israel makes it an issue to provide the legal profession with training, and know how on accessibility by conducting conferences, courses and lectures on the subject with speakers from Israel and abroad. (During the Summer of 2016 Access Israel hosted Justice Richard Bernstein, a supreme court judge from Michigan USA, who is also blind, and as part of his visit he gave lectures to Judges, Lawyers and Regulators). Access Israel promotes accessibility to improve the quality of life and integration of the elderly and of people with disability. The Organization works with various target populations, including decision makers, Knesset Members, businesses, local municipalities, and the public. We reach out through media campaigns, public relations activities, informal meetings with disabled individuals, conferences and lectures on accessibility by experts and unique events, such as the Feast of Senses to illustrate what it is like to do basic daily activities as a person with disability. This service is offered at a national and international level. 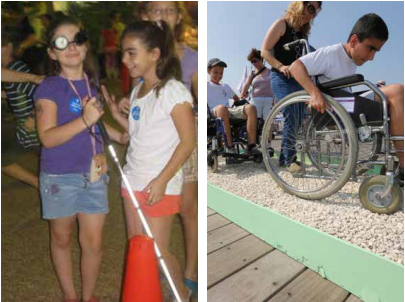 Following local successes in promoting accessibility and increasing awareness in innovative and creative ways and the willingness to share a successful model which brings about a real change in public perception, Access Israel was chosen by the organizers of the Zero Project 2016 in Vienna - Austria, to offer participants of the Conference the "Accessibility for All Trail" at the UN Headquarters in Vienna. 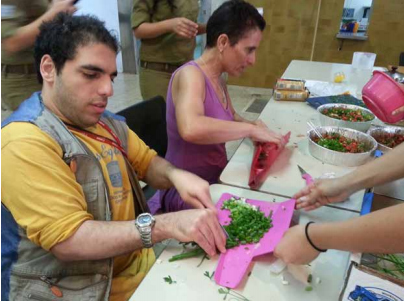 This Project led by Access Israel enabled participant and employees of the UN to choose a disability and experience it first hand while getting to know a person behind the disability. The willingness to participate was amazing and so were the reactions from the participants. 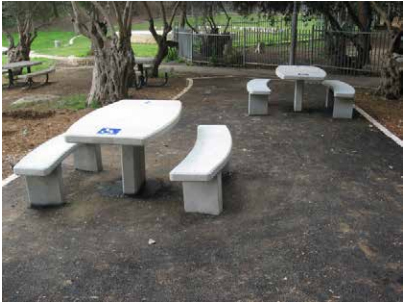 Access Israel promotes and establishes accessible trails and picnic areas throughout Israel to offer access to nature to everyone including the elderly and people with disabilities. This service is offered at a national level with emphasis on the regional level offering customization of the picnic areas according to the unique characteristic of each region. In addition, Access Israel provides year long updated information of accessibility in nature- parks, trails etc throughout Israel. 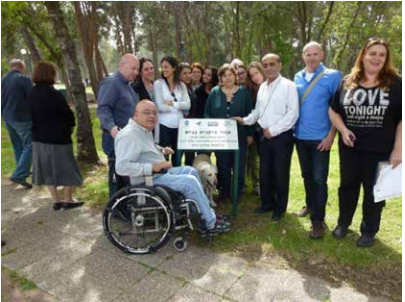 In April 2016 in cooperation with JNF Israel we declared the "Accessible Nature" and outdoors day offering information and accessible tours throughout Israel. People without disability that become disabled "in the middle of their lives" face a myriad of challenges, including emotional distress, adjustments to both physical and mental difficulties, loss of occupational abilities and more. The program provides newly disabled individuals with workshops and mentoring to increase their use of available services, provide them with tools to cope with their disability, offer guidance and support and facilitate their independent reintegration in society. This service is currently offered at a regional level. 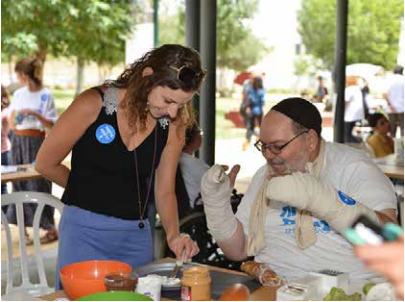 This unique project was developed by Access Israel to give influential people, service providers and decision makers a "taste" of what it feels to have a disability. 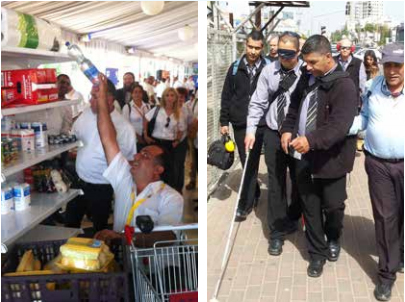 public awareness to accessibility but presents Israel in a favorable light. Participants responded with enthusiasm and stated that they had never before taken part in such an enlightening and rewarding experience. 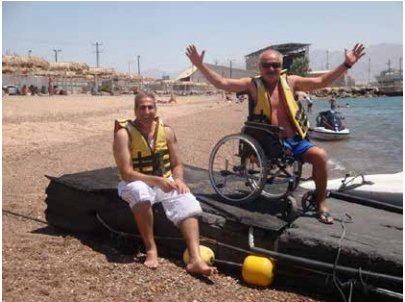 Operating Independent Living Centers and volunteer groups in the community across the country including Upper Galilee, Western Galilee and the Haifa area, Eilat and the Arava etc. with an emphasis on Israel's periphery. These Centers enable people with disability to integrate in to the community and receive tools for independent living. Our Centers include integrated groups of people with and without disability acting together, at eye level and developing local projects and activities fitting the area from which they operate. - Accessible Tan-dam bicycle group- enabling blind people to enjoy the sport in an integrated group. Our legal department assists individuals with disabilities and elderly people who have experienced discrimination or injustice based on their disability by different organizations or businesses, in order to promote the equality and rights of this population. Every year we respond to over 2,000 inquiries from people with various disabilities .